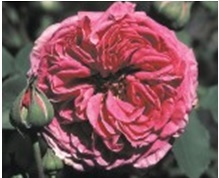 Bloom: Vigorous repeat blooming. Old rose perfume exudes from the 4 inch, old-fashioned blooms (petals 100). Interesting Facts: May be grown as a short climber.